Why is pediatric blood volume useful? How is the blood volume estimated in pediatrics? What's the blood volume in a newborn baby? What's the blood volume in infants and older children? 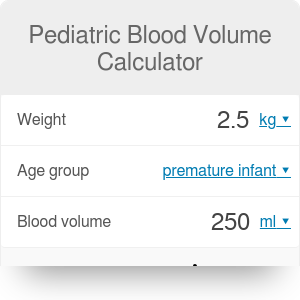 Our pediatric blood volume calculator uses body weight to find the total blood volume for children. The estimated blood volume in pediatrics depends on the age of a child, so that there are separate formulas for blood volume in newborn babies, in infants under 3 months of age, in children over 3 months, and in adolescents. Please note that this is a calculator for pediatric use. There is a separate calculator that estimates the blood volume in adults, and one that finds the volume of blood plasma. Similarly to the adult total blood volume, these values are vital in the hospital perfusion care, including hemodynamic and pharmacologic interventions, and transfusion practices. Aditionally, these values are also extremely important in the process of blood collection for tests. For an adult patient, collecting 20 ml of blood won't have a noticeable impact on the organism, whereas the same amount of blood is about 8% of a newborn baby's full blood volume. According to the existing guidelines, the maximum volume of blood that can be drawn safely from an infant in 24 hours is ranging from 1% to 5% of the total blood volume. 65 mL/kg for female adolescents. The volume of blood in a premature neonate ranges from 89 to 105 mL per kilogram of body weight, while a baby born in term has from 82 to 86 mL/kg of blood. The blood volume in infants up to three months of age is 82-86 mL/kg. It is assumed that after the third month children have around 73-82 mL/kg. The volume of blood per kilogram of body weight decreases with age and in puberty reaches about the same values as in adults, which is 70 mL/kg for males and 65 mL/kg for females. Pediatric Blood Volume Calculator can be embedded on your website to enrich the content you wrote and make it easier for your visitors to understand your message.